index of thousands of geographical names. That's the first such atlas of Tatras gathering so much informations in one volume. 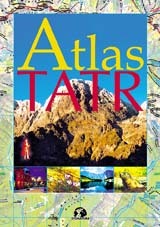 Atlas of Tatras, besides thematical maps in the directory, contains first of all maps in 1:25 000 scale, covering whole ridge and several settlements around. They are very detailed, with colour hill shading, full of geographical names, unparalleled to any existing works. Atlas identically treat Polish and Slovakian part. Pages of the atlas correspond to the valleys, giving almost complete information about them and surrounding peaks. The pages are enhanced with hundreds of brilliant photos. There is geographical net in the background suitable to identify objects, in index too. Besides the maps in main scale there is detailed map of Orla Perć (Eagle Path) in 1:5 000 scale here as well as city-maps in 1:15 000 scale.